Powerhive continued to show itself as a company to watch in the rural microgrid market with a $20 million infusion this week from eight investors, including manufacturing giant Caterpillar. Based in California, Powerhive was an early mover in developing rural microgrids in Kenya, where it has operated since 2012. The $20 million marks the second major investment made in Powerhive in recent months. Enel Green Power, an affiliate of energy multi-national Enel, in late 2015 made an $11 million equity investment in Powerhive’s projects in western Kenya. Powerhive develops scalable renewable microgrids in rural communities where schools, hospitals and critical services lack reliable power because of a poor connection to a central grid — or none at all. The latest infusion of funds will support Powerhive’s expansion into new markets in Africa and the Asia-­Pacific, as well as its continued growth in Kenya. “Powerhive has developed a unique platform and business model to address one of the fastest growing electricity markets in the next decade ­ energy access in emerging markets. Bringing sustainable and scalable electricity to these communities will be life changing for millions of people,” said Tim Woodward, managing director of Prelude Ventures, a green tech venture capital firm that led the round of funding. “We are excited about our investment into Powerhive as it further positions Caterpillar as the go-to source for the complete microgrid solution,” said Steve Niehaus, Caterpillar vice president with responsibility for the Electric Power Division. In addition to Caterpillar Capital Ventures, the investors in Powerhive’s latest round are Total Energy Ventures, a subsidiary of French oil & gas giant Total; Tao Capital Partners, whose portfolio also includes SolarCity; First Solar, an early backer of Powerhive; Pi Investments, and others. 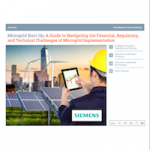 Powerhive has been achieving firsts in microgrid development in Africa. Last year, it won a major concession as the first private company allowed to generate, distribute, and sell electricity to the Kenyan public. Afterward, Enel Green Power teamed with Powerhive to invest $12 million in microgrids for 100 villages in Kenya. Enel contributed 93 percent of the money and Powerhive seven percent. The 1 MW solar and storage microgrids are being built in the counties of Kisii and Nyamira in the western part of Kenya and will bring power to 90,000 people. Only about 30 percent of Kenyans have electricity, but the area has a relatively high cell phone penetration rate, making it ripe for off-grid electrification, according to Enel.